So, Andy decided to opt out. That's great for Andy to have those choices, but for the Yankees this is nothing short of catastrophic. Right now, the pitching rotation card for Joe Girardi reads as such: In big bold letters "Chien-Ming Wang," then 4 question marks right after. Can rapidly aging Mike Mussina hang on for one more year? Can Joba adjust to the rotation? Are Phil Hughes and Ian Kennedy for real? One feels good about them; Hughes was number 4 on Baseball America's 2007 Top Prospects, Kennedy was the Minor League Pitcher of the Year. But Girardi has to ask himself, "Would I be comfortable throwing out this rotation against the Red Sox?" The smart money says the Yankee Brass isn't either. Which brings me to fear number two. The first fear is how are these kids gonna perform, which is a healthy fear. A good, reasonable fear. But the second, more troublesome fear is what if we go out and make the stupid trade; the Al Leiter for Jesse Barfield trade; the Jay Buhner for Ken Phelps trade. With A-Rod gone and now Andy on the fence, you can smell the desperation from the Bronx. Which begs the question from every fan: do we try to rebuild from without or from within? So far, the Yankee Brass has been saying all the right things. Hank "Mini-George" Steinbrenner was quoted just last week saying the P-word, which was never heard in Yankeeland before. We'll believe it when we see it, Hank. Because frankly, too many times, and especially since 2000, we've gone into the Winter Meetings with the mindset of "Who are we gonna get? We've got to make a big splash." And the result has been Tony Womack, Sheffield, Damon, Pavano. Which is not to say we shouldn't look around. On the contrary, we should most certainly look at what's out there. 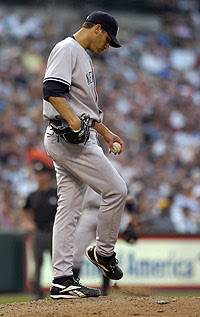 The plan for the 2008 Yanks should be to get a a solid, professional low-risk pitcher for the short-term. A Scott Brosius type. Sign him short-term for a middle-of-the-road contract, and let Girardi and Pena (two former catchers), along with Dave Eiland, groom the young pitchers. Andy was Yankee Stadium born and bred. He was groomed under the big lights at Joe Torre and Don Zimmer's side. Money, no matter who it buys you, can't replace that. 3rd base is another problem. A lot of talk has been going for Miguel Cabrera. Aside from the fact that it will be confusing to have to two M. Cabreras in the lineup, there have been questions about Miguel's attitude. Can Girardi get the best out of him? Or will he become a surly, contract-eating Danny Tartabull? Also, who do we give up to get him? Would you give up Joba and Cano for him? And this nonsense about getting a disgruntled Scott Rolen makes no sense. A notoriously broken 3B on the wrong side of 33 (by next spring). Ummm, no thank you. Or is Betemit the answer? No one's denying the talent is there. But he's been traded twice in the past 2 years, from organizations famous for grooming young talent. And his performance last fall, albeit brief, was underwhelming. Again you ask, can Girardi get the best out of him? One wonders if Larry Bowa could have gotten to Wilson. And even the best options have their own problems. Joe Crede could be an option, but he just had back surgery. If healthy, he could be a nice option, but a back injury at age 29 raises a humongous red flag. The same is said for Chad Tracy, whom the D-Backs would like to trade. He just had microfracture surgery on his knee and could be out up to 8 months. Another option is Brandon Wood on the Angels. A top prospect, he had an awful major league debut last year. However, he'll be only 23 by Opening Day and is still considered an awesome talent. If the Angels get A-Rod, what happens to Wood? And with all these guys, what would it take to get them? Cano, Hughes, Joba? Cashman is going to have to do some serious soul-searching this off-season and some serious haggling. Would Atlanta take Damon and Farnsworth for 25 year old righty Yunel Escobar? Is he the answer? With all these questions, it's tempting to look for certainty. So here is one thing that is certain—if Petitte is truly gone, the 2008 Yankees are going to have to dig deeper and the kids are going to have to grow up faster to make up for him.